18 Resembling a Moroccan mosaic, Walker Zanger’s Duquesa Fatima decorative field tile makes a beautiful vintage statement in this kitchen. We seem to have developed a love affair with the backsplash. Once deemed as the protector of the wall behind your cooktop or sink, the backsplash has now become one of the most important design elements in the kitchen. 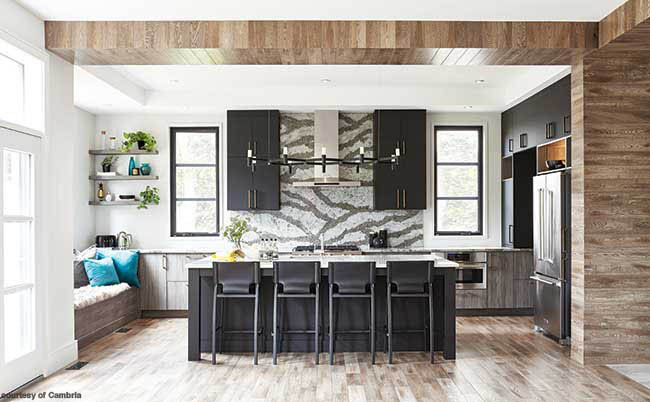 You can pick out your favorite cabinet, the most durable material for your counters, and the perfect range for your cooking needs, but the backsplash seems to take on a life of its own. 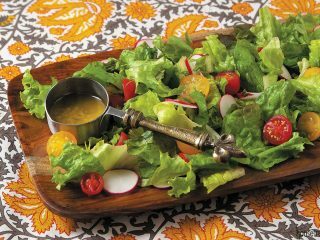 There are so many options available, more so than ever before. 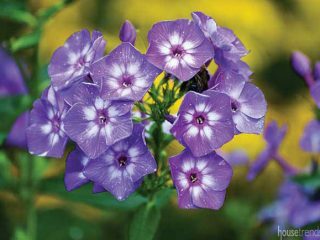 Here’s our take on some of the most popular trends and styles available to you today. 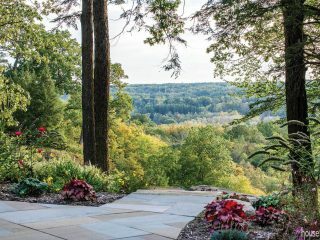 We’ve been seeing this application more and more in kitchen design—big, beautiful slabs of granite, quartz, and glass being carried up the walls. Easy to clean and easy on the eyes, if grout lines aren’t appealing to you, a slab or panel backsplash might be the perfect alternative. 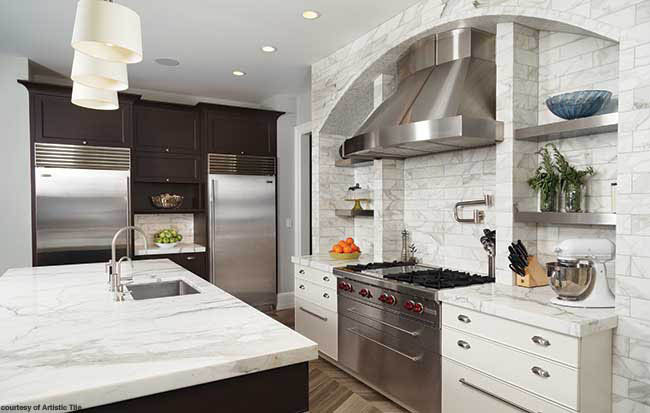 A slab of Cambria’s Brittanicca quartz was used for this backsplash, drawing eyes to the stunning gray veining that mimics the look of marble behind the range. 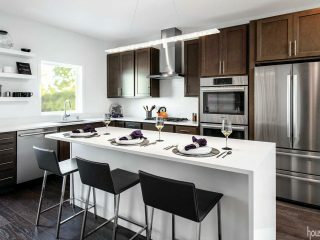 The Star White glass slab from Walker Zanger is completely maintenance-free and creates a sleek design aesthetic in this contemporary kitchen. 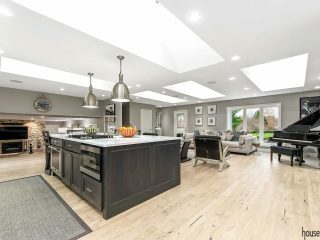 Cambria’s Galloway quartz was carried all the way to the ceiling behind this stainless steel range hood, creating a dramatic focal point in this modern kitchen. 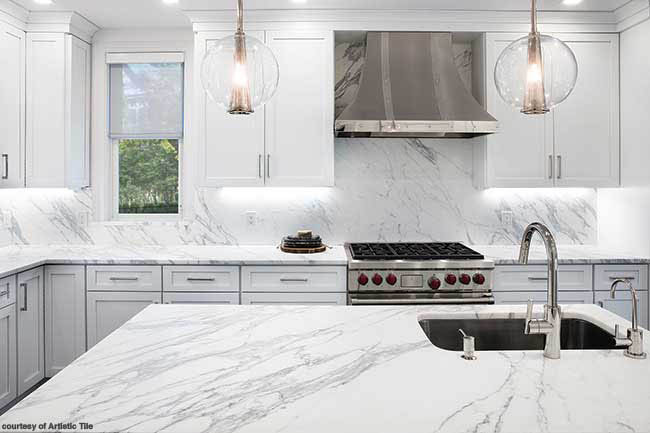 Gorgeous slabs of Calacatta Gold marble from Artistic Tile were used for the countertops and backsplashes in this kitchen, creating a seamless transition from counter to wall. 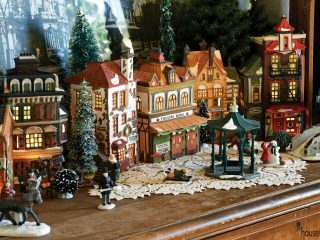 A few years ago 1×1-inch mosaic tile was everywhere. 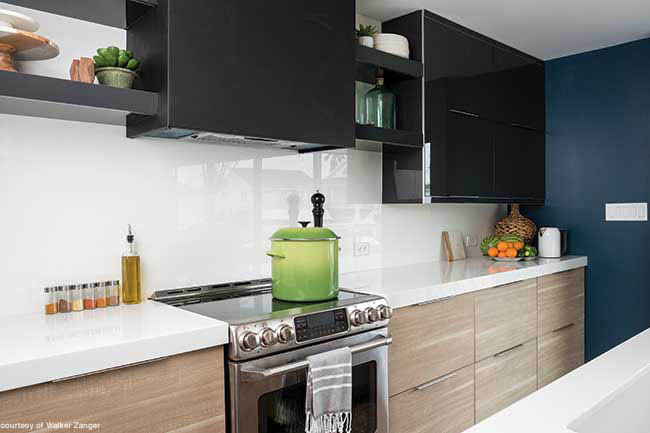 The shiny, minute tiles were the go-to choice for anyone with the desire to create an eye-catching focal point behind their range or cooktop. 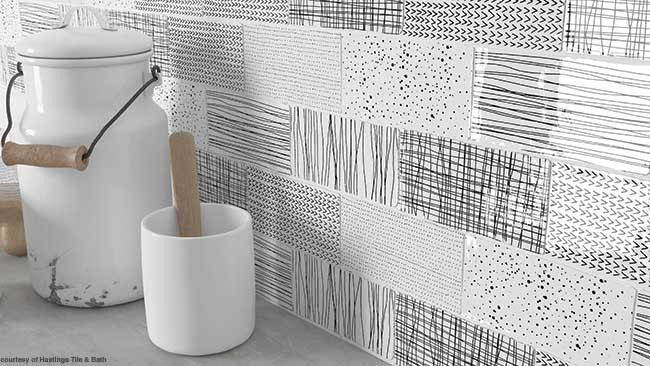 That trend slowly transitioned to sleek linear mosaic tile, which is still quite popular today. 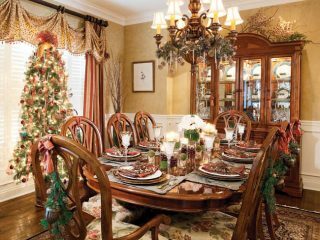 But, the mosaic tile backsplash has morphed once again, thanks to a wide variety of shapes, bold patterns and impressive designs. The alluring curves and soft blue hue of this backsplash, comprised of Walker Zanger Jet Set Mai Tai in Cadet Blue, creates an illusion of movement behind the range in this elegant kitchen. 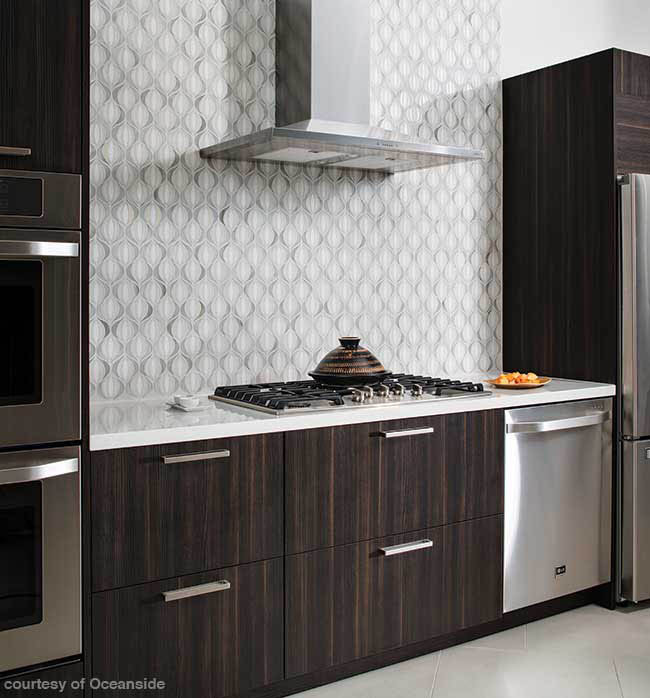 The graphic nature of Oceanside GlassTile’s Devotion Lotus mosaic tile creates a couture look in a clean, modern kitchen. Crossville’s Ebb & Flow mosaic wall tile in Flora & Fauna successfully blends the beauty of stone with the clean look of glass, creating a timeless backsplash design. 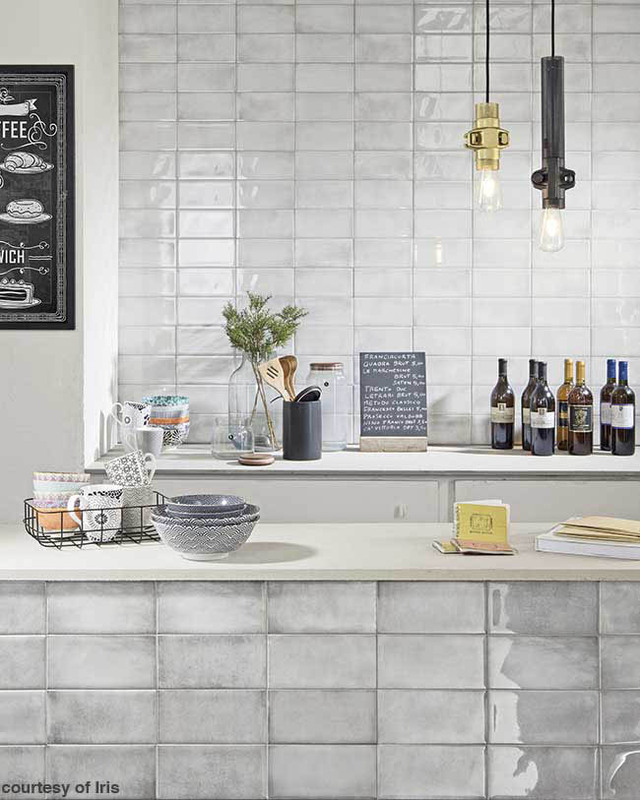 The subtle pattern depicted in Artistic Tile’s Shiraz Bianco mosaic tile blurs the lines between traditional and modern design, allowing this backsplash to stand out in any atmosphere. The iridescent look and geometric shape of Oceanside GlassTile’s Tessera Meridian mosaic tile adds the perfect touch of bling to this kitchen. You can’t go wrong with a traditional subway tile backsplash—it’s timeless, classic and beautiful. 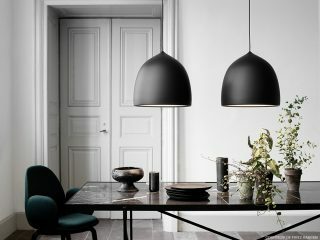 But we are now seeing some very unique variations of this rectangular tile that’s putting a twist on this kitchen design staple. 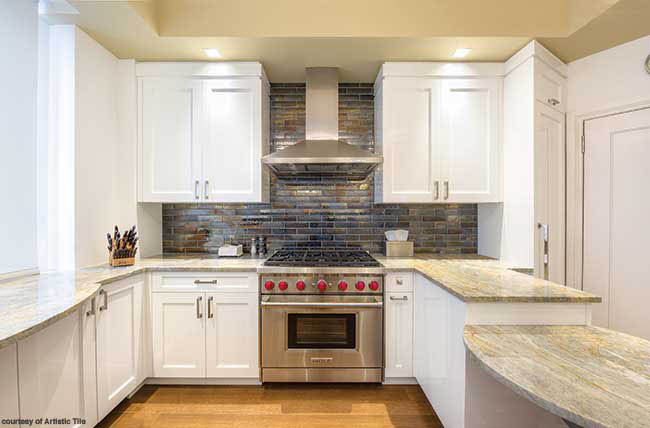 If you like the look of subway tile or brick patterns, this could be the backsplash design for you. 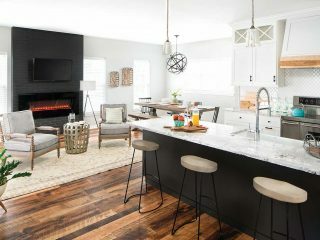 The large format field tile backsplash is the perfect complement to this modern farmhouse kitchen. 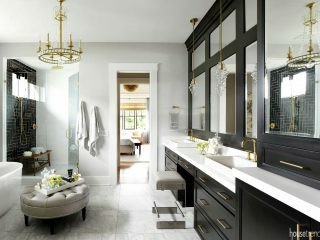 The 8×12-inch black natural stone tile from Jeffrey Court creates the ultimate focal point behind the sink. 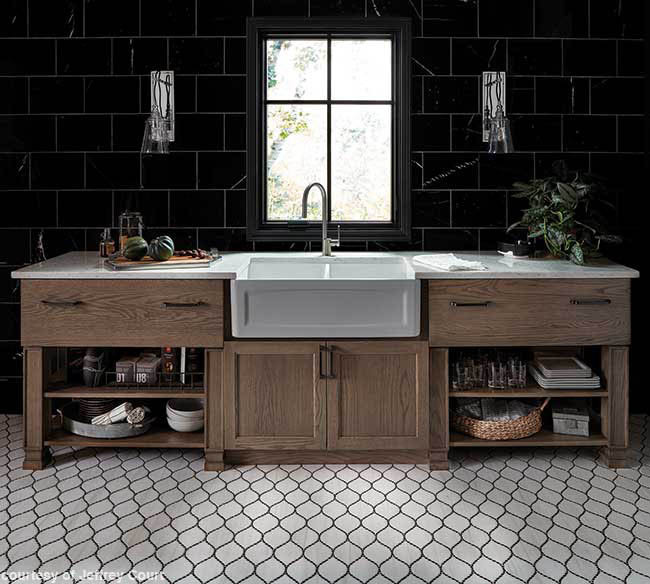 The handmade Décor collection from Hastings Tile & Bath puts a unique spin on classic white subway tile. 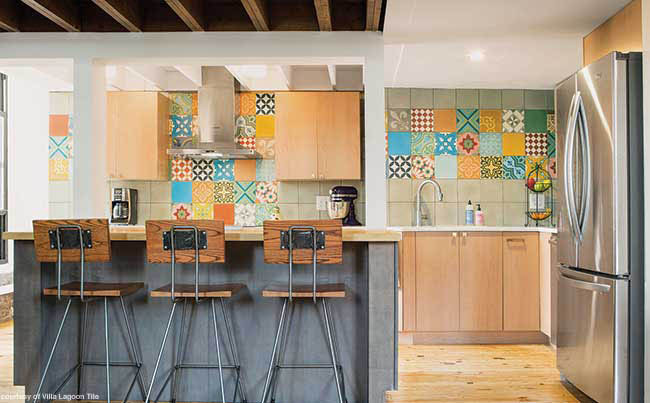 The 3×6-inch tiles offer patterns ranging from hand-drawn horizontal lines to vertical lines and dots—adding character and whimsy to an otherwise ordinary backsplash. The sleek brick shape, paired up with the metallic shine with hints of brown and blue, allows Artistic Tile’s Kyoto Steel tile to stand out in the crowd. Offering a hint of romance and glamour, this backsplash features Iris Ceramica’s Be In collection of tile. 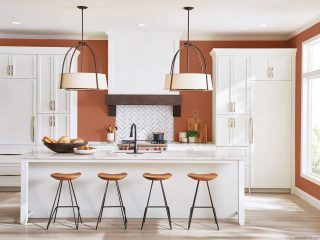 The vintage-inspired modular tiles come in a variety of soft colors, including white and gray, laying the groundwork for an invitingly clean kitchen. 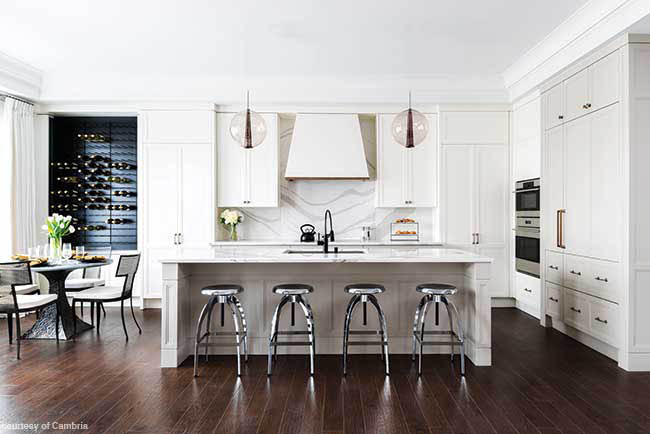 The epitome of luxury, Artistic Tile’s Calacatta Gold field tile commands attention in this kitchen. The classic Italian polished white marble features soft gray and gold veining for a one-of-a-kind look. 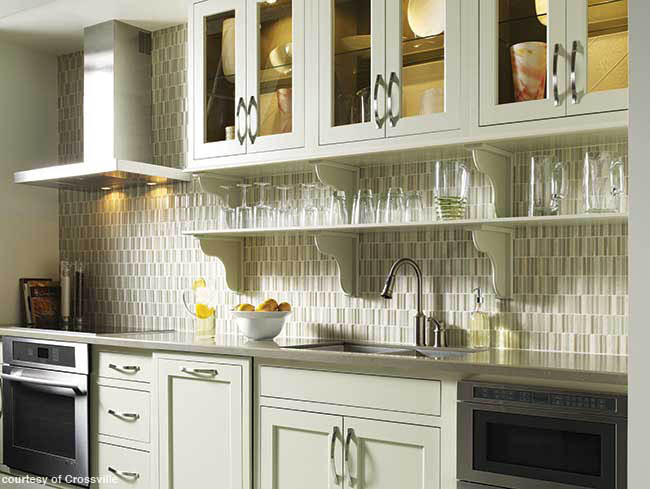 The backsplash is a great place to experiment with bold designs, patterns, colors and materials. 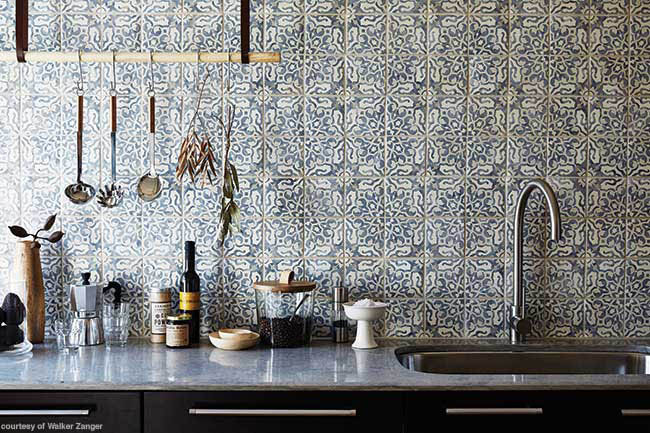 From eclectic cement tile to floral porcelain tile, a pattern backsplash works in any kitchen style. 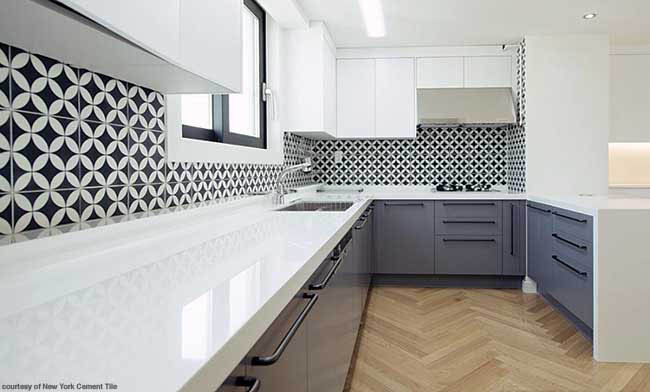 The black and white design of these cement tiles from New York Cement Tile establishes the bold, contemporary design in this sleek kitchen. 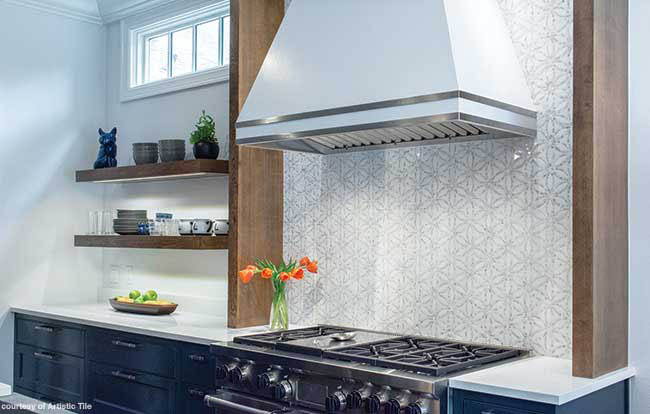 By randomly mixing and matching the geometric shapes featured in the Tangram collection, designed by Atelier, from Hastings Tile & Bath, homeowners are able to create a truly original backsplash. 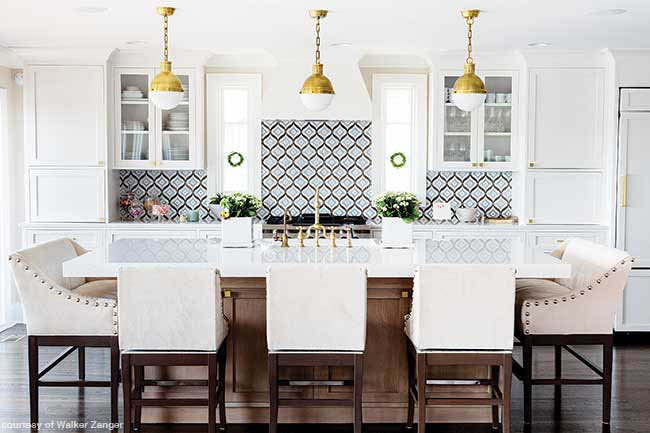 Resembling a Moroccan mosaic, Walker Zanger’s Duquesa Fatima decorative field tile makes a beautiful vintage statement in this kitchen. A subdued, neutral palette offers the opportunity to include an extraordinary backsplash. 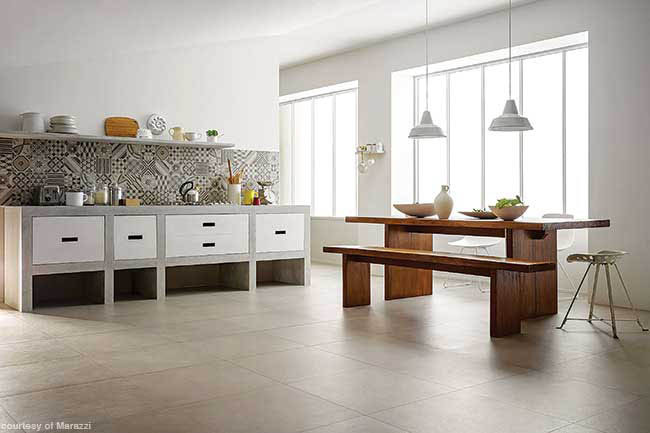 The Block collection from Marazzi USA offers a series of decorative tiles featuring a variety of shapes that can create a unique look. 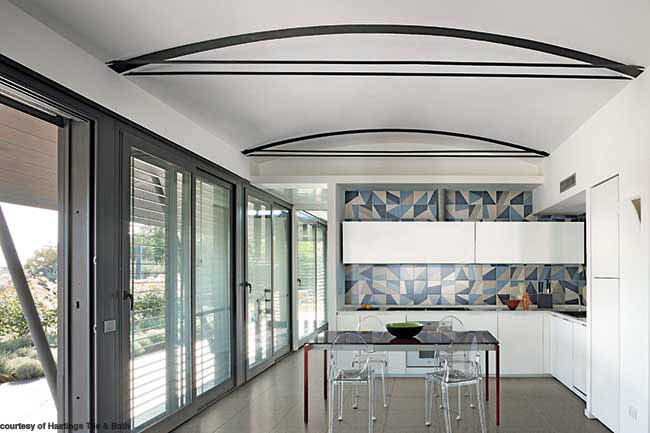 The patchwork look might not be for everyone, but it sure does create an eye-catching design. 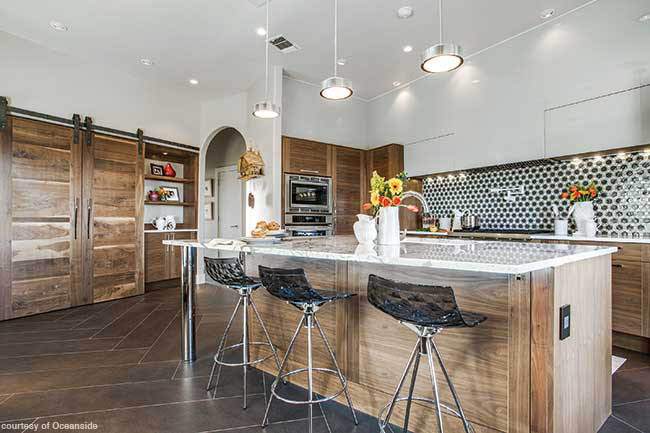 This contemporary kitchen comes to life thanks to the South Beach patchwork cement tile backsplash from Villa Lagoon Tile.